Flash, Ah-ha, He'll save everyone of us. Oh yes, this is the version of this movie you've been waiting for. To celebrate the 25 anniversary of the release of Flash Gordon, they've remastered the disc with a beautiful new 16:9 anamorphic transfer. The movie has never looked so good. Not only that but the sound has been remixed and is now available as a DTS or Dolby Digital 5.1 option. With the DTS sound the movie really comes alive. The plot follows the original Flash Gordon serials, Earth is under attack from an unknown source with Earthquakes, Floods, Storms and other freak weather happenings. Only Hans Zarkov realises it is the work of some alien force and sets of, with the unwilling help of Flash and Dale, to find the cause (Has he never heard of SUV's and Global Warming?). 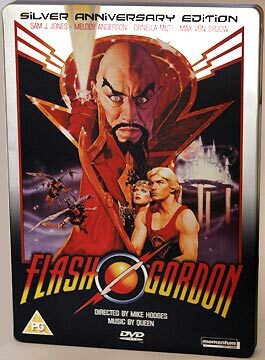 Flash and company arrive on an alien world where the evil dictator Ming the Mercy-less rules with an iron will. Flash and his friends must make new allies amongst the princedoms under Ming's control as well as face many challenges to defeat Ming and save the Earth. What really makes the movie a classic is how close it remains to the original 30's & 40's series and the great rock soundtrack from Queen. For Rocky fans, apart from the obvious SFDF link we have Richard O'Brien featuring throughout as Fico, one of the aliens Flash meets. Imogen Claire (Transylvanian RHPS) also appears. The disc is presented in a limited edition Silver/metal effect case which looks really smart. All images and text used on this web page for review purposes only.